Black hardbound notebook, debossed NSHSS crest logo, classically elegant, genuine leather, non-refillable, with 80 perforated FSC ivory lined sheets with date feature. 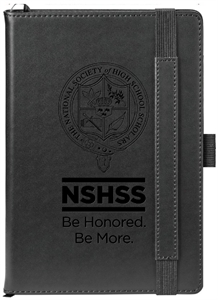 NSHSS inkpen included. Black ribbon bookmark, pen loop holder, gusseted interior back pocket for storing small documents. Close it all up using the elastic and leather closure. Product dimensions: 5.5" x 8".